Asthma self-management represents a systematic way of educating patients to control the disease by avoiding it when possible and reducing it when necessary. In its present form, it has been practiced for little more than 30 years. It was encouraged initially by the National Institute of Health (NIH) through support of extramural asthma self-management research, and subsequently, by its inclusion in the first NIH asthma diagnosis and treatment guidelines (NIH 1991). The seminal programs (Clark et al. 1980; Creer et al. 1988; McNabb et al. 1985) developed with the help of NIH were concerned with control of pediatric asthma. Subsequent work has expanded to cover a variety of other populations, both pediatric and adult, as well as individualized programs. This chapter represents an overview of existing self-management programs as well as an evaluation of their effectiveness. The term ‘self-management’ is not to be confused with ‘self-care.’ While the goal of self-care is to reduce the role of the physician in the treatment of disease, self-management recognizes the importance of the physician and encourages the patient to partner with the physician in the management of the disease. The partnering relationship implies that the physician’s effectiveness in managing asthma increases in direct proportion to the quality of asthma information provided by the patient. To be successful, asthma self-management requires the patient to understand the essential features of asthma including: the physical changes underlying difficult breathing, asthma triggers and symptoms, how to evaluate asthma severity, and how to prevent asthma and reduce its exacerbation. 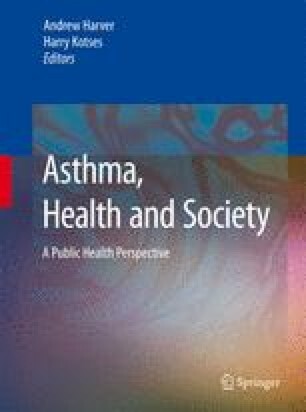 These facets of asthma constitute a blueprint for the development of asthma self-management programs, and represent the elements of effective, chronic disease management. Toelle BG, Ram FSF (2004) Written individualized management plans for children and adults. Cochrane Database Syst Rev Issue 1, Art. No. CD002171.pub2. DOI: 10.1002/14651858. CD002171. pub2.